Perhaps this will help clear up what is meant by "companion" horse... This is Fort William aka Slew Baby. Since I've been having health issues this month, he comes to the door to check on me & then stands by my chair napping... He truly is an angel!!! Thank all of RMR for this blessing aka "companion"!!! 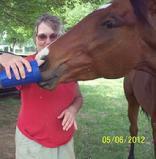 Some retired racehorses can not be rehabilitated and retrained to be riding horses. These special horses still live very happy lives, just need a little extra love and care. They can bring so much joy and build special bonds with their owners. Many of these horses are used for new therapies with Autistic and Aspergers Syndrome children with much success. They also are great companions for older horses and good babysitters for young ones. Most of our companion horses do not require any extra care or medications, but love all the extra things you do to make them feel special. Consider adopting a horse that needs a special place to live out his days and a home with a family that will love him throughout them. Please help us continue our mission to retrain the horses donated to our program and give them the opportunity to have wonderful lives after the track.